It's been a long time.When we last left off we had just finished an extended look into the ups and downs of BPMs and innovation in club/dance/whatever music. But like a funky old snake shedding his skin, your trusty, dusty vinyl loving hussy The Inner Sleeve has moved on to a new incarnation.You see it's all good and groovy to riff on music and more but what you really want and need is to know what is down with Rat. As in the shop itself, the Tk Maxx of Wax and more. The adventures of an intrepid Highlander and his vicious gang of black gold miners. 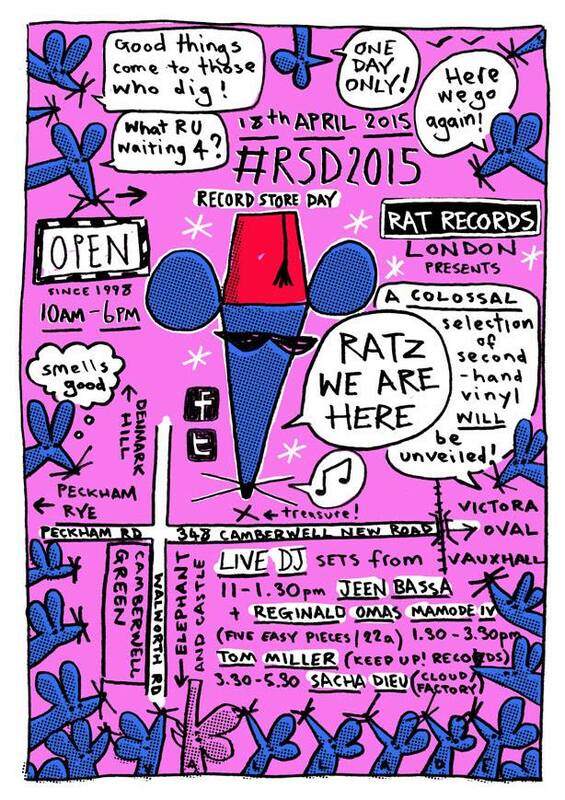 What have they been up to and what is in store next.And that, this Saturday, is Record Store Day 2015.It's our biggest day of the year and we stash as much magic as we can in anticipation for it all. Tom, Pete and Philippe have been known to put out records they would rather keep for themselves to keep all our beloved customers new and old lucky, happy and grooving.We'll have plenty of top artists spinning on the day and here is the latest lineup:Reginald Omas Mamode IV (Five easy Pieces/22a)Jeen Bassa (22a)Tom Central (Keep up records)Sacha Dieu (Cloud Factory )Record Store Day has always been good to us, and anything that brings more people into the scene and life of vinyl ultimately rocks. Yes, there is plenty of hype. And yes, there is a lot a product that does not really need to be, and none of us will dig.As the most independent of independent shops, we don't lay on the bummers the mainstream can around RSD - with not enough records pressed fast enough or in store.And eBay scalpers more likely to own a new Audi estate than a turntable often nab them first anyway.There are a lot of haters creating their own hype around RSD to pimp an ivory tower perspective, too. Hand pressed soya based acetates in a bag with someone's mate rapping over Tibetan Nose Flutes is a product too. That someone, no matter their higher intentions, will need and want to sell. Getting nasty about RSD is a way to do just that.We don't sell product, we sell sounds - and we are in it just for the love.RSD surfs that fine line of needing and getting help and 'exclusives' for the majors, while trying to stop the creeping stinking blob of uncool exploitation smothering the best of the idea.Talking to reporters, bloggers and the like about it - they are totally bored with both the mindless pimping of a best unheard Jack White attempt at the Blues being shoved down the throat of independent shops by the Man and the AND the haters who have their pressings delayed or feel left out of the bandwagon.Leave them all to it, and come on down.When we see you all Saturday, we will all feel what its supposed to be for, and about.